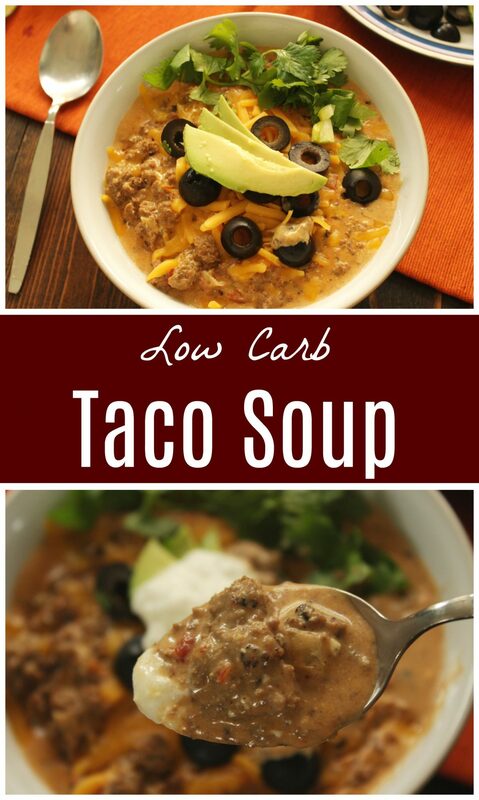 This low-carb mexican-flavored taco soup brings all the flavor of tacos to your soup bowl! Make extras, you’re going to love this for the next day or two leftover as well. Like our dairy-free version of Taco Soup, this soup is flavorful, but this one is also creamy and rich with the addition of cheddar and cream cheese. 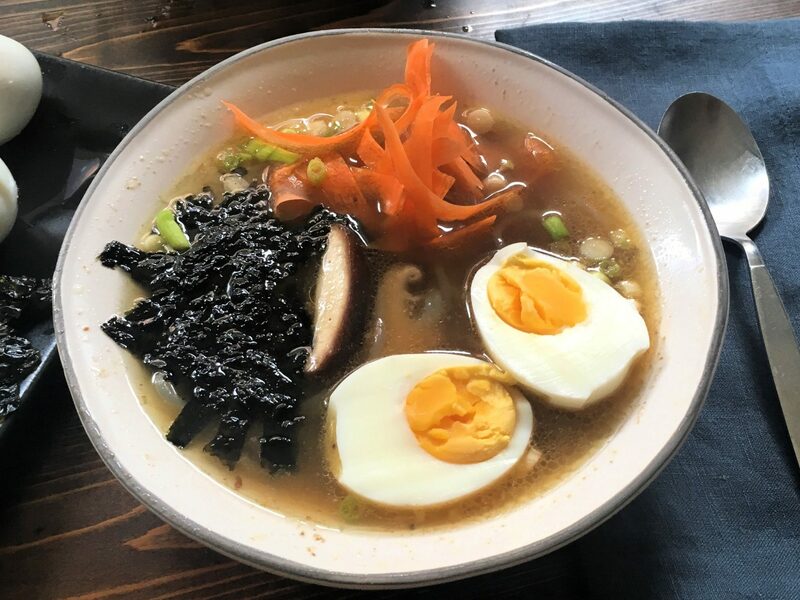 This is a great soup to serve company. Everyone loves the flavors, and won’t even miss the carbs! This taco soup recipe also is simple to make, and it’s one that my kids love to help with. When kids help with dinner, they are learning that cooking from scratch is normal and they are tucking kitchen skills such as browning meat and chopping onions into the automatic part of their brain. This sets them up for success later in life, when it’s just automatic to thaw the meat you need for dinner in the morning and stand over the stove browning meat for dinner. Something is going to end up in the automatic part of their brain… and we really don’t want it to be playing video games and waiting for someone else to produce dinner, do we? Do you know how important the long-term memory is for establishing healthy habits? Think about how you put on your pants in the morning, or wash your hair… it probably just happens, and isn’t something that you specifically think about. Now think about your preschooler putting on their pants themselves, it’s probably a whole 10-minute ordeal that involves sitting, tugging, and possibly admitting defeat and asking for help. Think about teaching your 7-year-old to wash their own hair… you have to specify every step, and they still occasionally come out of the shower with completely dry hair, or worse, with sudds dripping everywhere because they forgot to rinse. Just like dressing themselves and washing themselves, we want to let our children struggle a little bit under our guidance so that soon enough they too can put their pants on lickety split, and efficiently take shower, getting completely clean and ready to start the day. This is what happens when we teach kids to cook as children… it makes cooking just as easy as putting on our pants or washing our hair. I like my kids to brown beef and do similar cooking skills in the Instant Pot, since the pot is deep and the heat source is well insulated. They certainly need to use caution still with it, but it’s a little easier for them to navigate than pans that slip around on the stovetop, or the gas burner that doesn’t always light easily. Want your kids to cook real food? Sign up for Kitchen Stewardship’s Kids Cook Real Food class! She’s amazing… we’ve used her program for all 3 kids and I can’t say enough good things about it! Melt butter in the bottom of a small stock pot or in the instant pot on saute mode, medium heat. As the butter melts, peel and chop the onion, then add to the melted butter. Stir onions occasionally, and when they start to become translucent, add the ground beef and taco seasoning. Brown ground beef, then add in the diced tomatoes. Stir in the broth and mix well. Simmer 20-30 minutes. Stir in the ranch dressing and cream cheese and allow cream cheese to melt, another 5 minutes. Add salt and pepper to taste. Serve, garnishing with cheddar cheese, sour cream, sliced green onions, olives, cilantro, and avocado. 7 grams net carbs per serving. For more keto-friendly dairy-free recipes, sign up for our Keto Family Class! We have both dairy-free menus and menus that do have dairy. If you need a break from dairy, or you avoid it completely, you're covered with the Keto Family Class!